"As with the first, this just begs to be read aloud to a group of preschoolers, who won’t be able to help shouting out their answers. More please." Finally, it's October, and I have been holding onto this wonderfully adorable book since August! Broom across the moon, Pointed hat at the window, Hair-raising cackle, Can you guess who from this haiku? Come on, who doesn't love that? 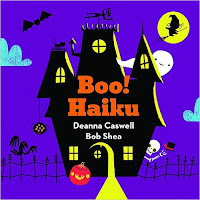 The author/illustrator team behind Guess Who, Haiku is back with Halloween-themed poetry for even the youngest readers. With spooky critters hiding on each page, children will delight in this seasonal guessing game in BOO! HAIKU. Not only does the book have poetry (which I love because I'm an English teacher), but the team includes a page in the back of the book that explains the structure of a haiku as well as the definition of a syllable, which makes the book accessible for toddlers to young readers. The illustrations are very child appropriate but still spooky for Halloween. Each page begins a new haiku which asks you to guess to whom the haiku refers. There is a small hint under the haiku before you flip the page and see the answer in both illustration and word form. Purples, yellows, and oranges jump off the page along with a witch, an owl, a bat, a skeleton, etc. I can only hope there's a Christmas edition!